Just here at the ballpark right now as working member of the media tonight as the Orioles face the Seattle Mariners in a little bit. The Orioles hope to snap a four-game losing skid; meanwhile, the Mariners shed some weight – and baggage – by releasing embattled slugger Milton Bradley earlier today. When Seattle comes to town, it’s always a pleasure seeing Ichiro Suzuki in action. The man is amazing to watch at the plate and he’s got one hell of an arm in right field. Really, the two teams are very similar – that is, they both are near the bottom of all teams in the Majors offensively and mirror one another in other ways as well. For the most part, Baltimore’s lineup is the same with the exception that J.J. Hardy is back and batting in the ninth hole. I thought that some changes might have been made considering the play over the past two series, but the status quo remains. 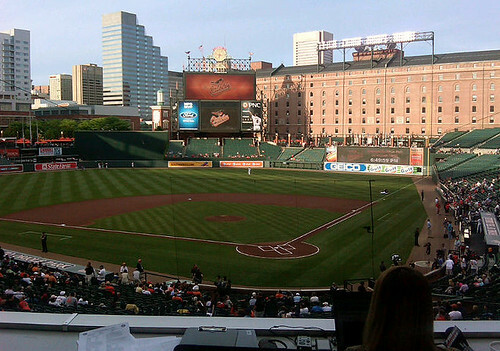 With Hardy being brought up to Baltimore, the Orioles made a corresponding move. Pitcher Josh Rupe was designated for assignment; therefore, it’s not a big loss. Finally, it’s good to see Ken Griffey here in Baltimore. The man looks the same, albeit a tad heavier in the waist. Griffey’s still got that electric smile and he was pretty talking to everyone on both the Seattle and Baltimore squads. He looks happy, comfortable and was watching his team practice with intensively.